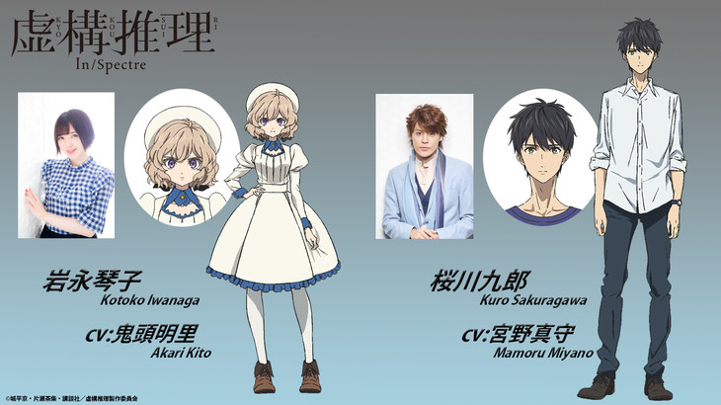 The official website for Brain's Base's Kyokou Suiri announced the main cast members on Tuesday. A commercial that advertises the tenth volume of the manga, which will ship on April 17, was also streamed and highlights the character's voices. Kyokou Suiri is a novel by Kyou Shirodaira and Hiro Kiyohara that is being published under the Kodansha novels imprint. Chashiba Katase began drawing the manga adaptation in Shounen Magazine R in April 2015. The anime adaptation, which is based on the manga, will be directed by Keiji Gotou (Mawaru Penguindrum episode director). Looks promising, can't wait to see it come out. Hmm. I was expecting a more quirky voice for Kotoko, but I guess this works too. The main heroine is fab and her love interest is a great character. Anyone know when it's supposed to air? She is actually sharp tongued, but not in an arrogant tsunderish way. If anything, I'd say it's a positive attribute to her character.